Propane and kerosene heaters provide portable heat for taking the chill out of a single room. 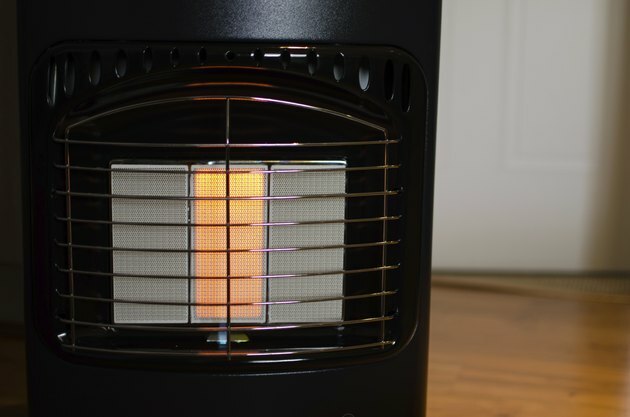 These heaters can be less expensive to operate than electric heaters, which makes them attractive to homeowners trying to cut the costs of staying warm. But if you use kerosene and propane heaters, you should be aware of certain dangers associated with portable fuel heater use. The National Fire Protection Association, or NFPA, reports that as of 2010, space heaters caused 32 percent of all home heating fires and 79 percent of all deaths from home heating fires. The main cause of these fires are space heaters that homeowners placed too close to flammable objects such as curtains or upholstery. Consult the manufacturer's instructions to determine the minimum safe clearance for your heater. The NFPA recommends a minimum distance of 36 inches on all sides between the heater and anything flammable. Using gasoline instead of propane or kerosene in your heater could result in explosion, according to the Consumer Products Safety Commission. If you have a kerosene heater, use only 1-K grade kerosene. Store the kerosene away from the house in a container used only for kerosene to avoid any confusion with gasoline. Improperly maintained heaters could also explode or catch fire, so follow the manufacturer's instructions for regular cleaning of the heater's wick and chimney. Don't allow soot to build up in the heater. Take the heater outside to refill it, but don't overfill it. Don't smoke while handling fuel or refilling your heater. Always allow your heater to cool completely before you refill it. Refilling a hot heater with kerosene or propane can cause flare-up, resulting in severe burns to anyone standing nearby. Don't allow children to play near the heater. If you have small children or pets, put a gate or guard around the heater to keep them from accidentally bumping into the heater and getting burned. Carbon monoxide is an odorless, colorless gas that kills by depriving the body of oxygen. Fuel heaters that aren't working properly can be a source of carbon monoxide. Newer heaters should be equipped with oxygen-depletion sensors that automatically shut off the heater if oxygen levels in the room fall too low. If your heater doesn't have this safety feature, you should replace the heater. The Consumer Products Safety Commission recommends opening a window at least one inch to allow fresh air into the house whenever you operate a kerosene or propane heater. Install a carbon monoxide detector in your home if you use a kerosene or propane heater.